This is the home page of "Japan Karatedo Federation Wado-Kai". N.B. Opening times for examinations are subjected to change according to the number of examinations. ♦Seminar: Kihon(basics) Kihon-Kumite and Kata. Kihon: From Jun-Zuki to Tobikomi-Nagashi-Zuki, Keri(kick)to be included. designated as a required Kata to perform. The other one is optional; free-choice from Wadokai Katas. Kihon-Kumite: On the day of examination, 2 kihon-Kumite moves, out of all the 10 Kihon-Kumite moves, are to be required for examinees to compulsorily perform. Kihon: From Jun-zuki to Tobikomi-Nagashi-Zuki, Keri(kick) to be included. Kihon-Kumite: Ippon-me(the 1st move)is essential for all the examinees. On the examination day, either 5 odd numbered Moves or 5 even numbered Moves are to be required for examinees to compulsorily perform. Kata: 3 Katas in total. Chinto and Seishan are compulsory to perform. After announcement of the examination results, successful candidates for Dan-grading examination will be required to pay at the reception desk for the proper Registration fees specified on Table1. After receipt of the examination results sent by post later on, successful candidates for Instructor Examination: will be required to pay the proper registration fees as designated by the letter. *From 2011, candidates for 1st class Instructors are required to hold 2nd class Instructor license before taking the desired higher-class examination. *From 2014, candidates for 2nd class Instructors will be required to hold 3rd class Instructor license before taking the desired higher-class examination. Applicants are required to fill up the attached application form, and to send the completed one to the JKF Wado-Kai Headquarters in Tokyo. *Deadline: Friday, January 18, 2019 completed application forms must arrive at the Wado-Kai Headquarters not later than the above specified date. N.B. Regardless of qualifications or Dan-grade held in possession, any Wado-Kai members who are interested in the Technical Seminar for Instructors, or who aspire to become instructors, are welcome to join the Seminar. Hideho Takagi sensei, the chairman of the Wado-kai Technical Committee, passed away on August 14th, 2018. 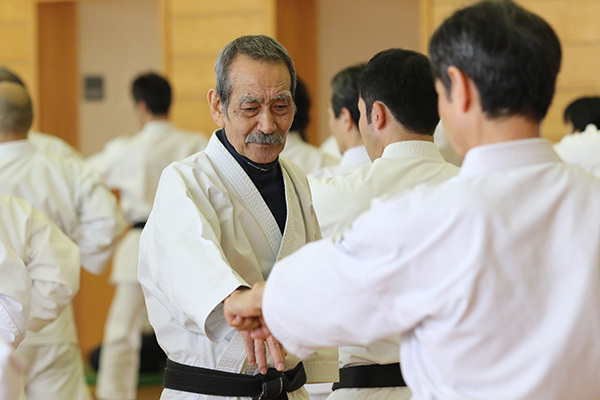 Hideho Takagi sensei, who served as Chairman of Wado-kai Technical Headquarters and Wado-kai Technical Committee, passed away on August 14th at the age of 76. We respectfully pray that his soul may rest in peace. Takagi sensei began studying karate in earnest after he enrolled in dental college in Japan. Studying under Tomihide Arimoto sensei, he also received guidance, and was recognized by, Wadoryu founder Hironori Otsuka sensei. He visited various locations with Otsuka sensei, acting as his partner in demonstrations. 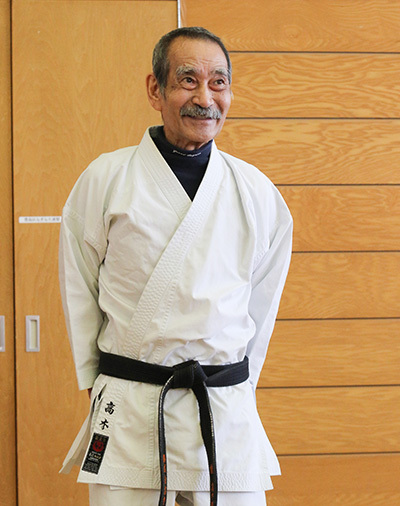 Takagi sensei's health deteriorated two and a half years ago. Even after this, he continued to come and instruct at Wado-kai technical seminars held at various locations, while still being hospitalized and attached to an IV drip 7 days of the month. He would also talk of his memories with Wadoryu founder Hironori Otsuka sensei in classes. Takagi sensei endeavored throughout his life in order to pass on the techniques and spirit of Wado. Here we will refer to the words that Takagi sensei left behind. "It was said by Otsuka sensei that 'learning carries a duty to pass on what you have learned'. Wado contains many of Otsuka sensei's ideas. This idea is not understood just by hearing it. I would like for it to be understood through training." WADO-KAI would like to show their appreciation to all of the non-Japanese WADO-KAI members for their compliance with the WADO-KAI Overseas Regulations, created on July 27th 2002, and thank them for their large contributions to their development. However, subject to the decision of the JKF WADO-KAI board, we have removed the following items within article 9 of the regulations (Standards for establishing the country headquarters) part 1, "Any country containing more than two branches may establish a country headquarters.". It will be reported that the abolition of the headquarters was decided by the International Department of the WADO-KAI Group. Accordingly, correspondence regarding the WADO-KAI Headquarters in the future (such as branch registration, member registration, promotion registration, etc.) will now be dealt with directly by the WADO-KAI branch in each country, with the cooperation of JKF WADO-KAI. We hope to continue the development of Wado Karate around the world with your cooperation. Our Bank Account for the remittance from overseas has been changed. The detail is on the page of Table of Fee. Mr. Masaru Shintani and his groups acting under the name of Wado-Kai in Canada are never affiliated with JKF Wado-Kai.